With more than 20 million customers and a distinctive experience, Rue Gilt Groupe has transformed the e-commerce world with curated boutique shopping, private member-only deals, and new personalization technologies. The secret to their unique and engaging experience is building upon the power of big data analytics. How Rue Gilt Groupe identified their key objectives and platforms to build on. 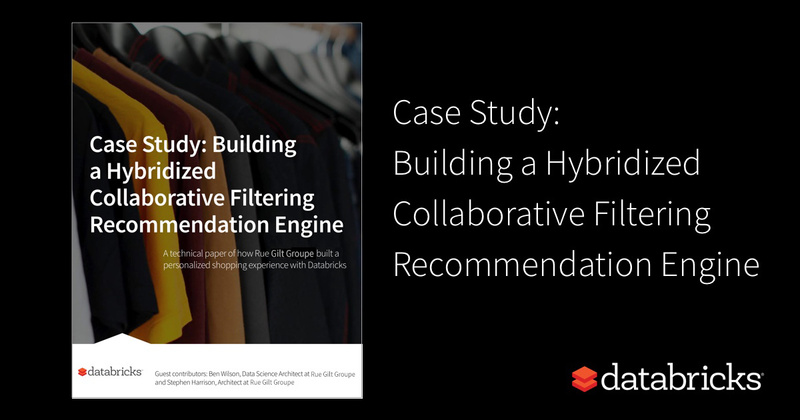 Why and how they implemented a Collaborative Filtering Model for recommending products. What technical challenges were faced and where further improvements can be made. Get the eBook to learn more. © Databricks 2018. All rights reserved. Apache, Apache Spark, Spark and the Spark logo are trademarks of the Apache Software Foundation.